I can’t remember when was the last time I ate Kaiserschmarrn. I do, however, remember when was the last time I made it myself. Never before! I really felt like having some today and since I love to cook, I decided today was the I made it myself for the first time. I asked my mom how she used to make it for me when I was little and followed her instructions, but used spelt flour instead of white flour and xylitol instead of sugar. I also decided to separate the egg whites and egg yolks since this always makes everything fluffier. And who doesn’t love fluffiness? 1. In a medium bowl, mix the egg whites and a pinch of salt with an electric mixer until they get glossy and form soft peaks. 2. In a separate bowl mix the egg yolks and xylitol until the mixture turns pale yellow and gets fluffy. 3. Add the rice milk and mix until just incorporated. Slowly add the flour until you reach the consistency similar to that needed for American pancakes. 4. With a plastic or wooden spatula, carefully incorporate the egg white mixture and sultanas in the egg yolk mixture and try to lose as little air as possible. You want your mixture to be as fluffy as possible. 5. Heat a medium pan with some olive oil to medium heat. 6. 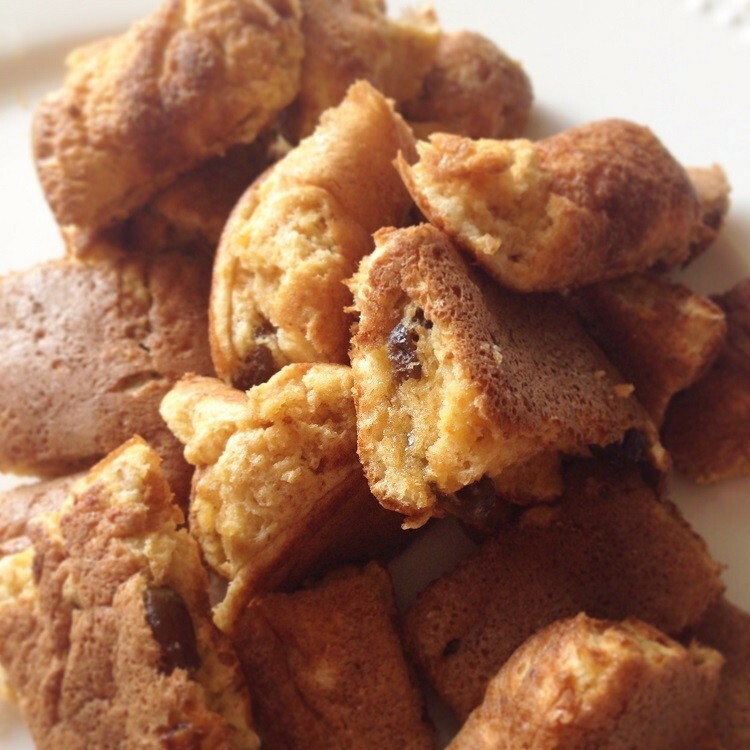 Cook the Kaiserschmarrn on one side until light brown. Should take about 3 – 5 minutes. To check whether it is done, carefully lift it on one side with a spatula. Once done on one side, use two spatulas to get under the entire Kaiserschmarrn and carefully but quickly turn it around. Cook for additional 3 minutes. 7. 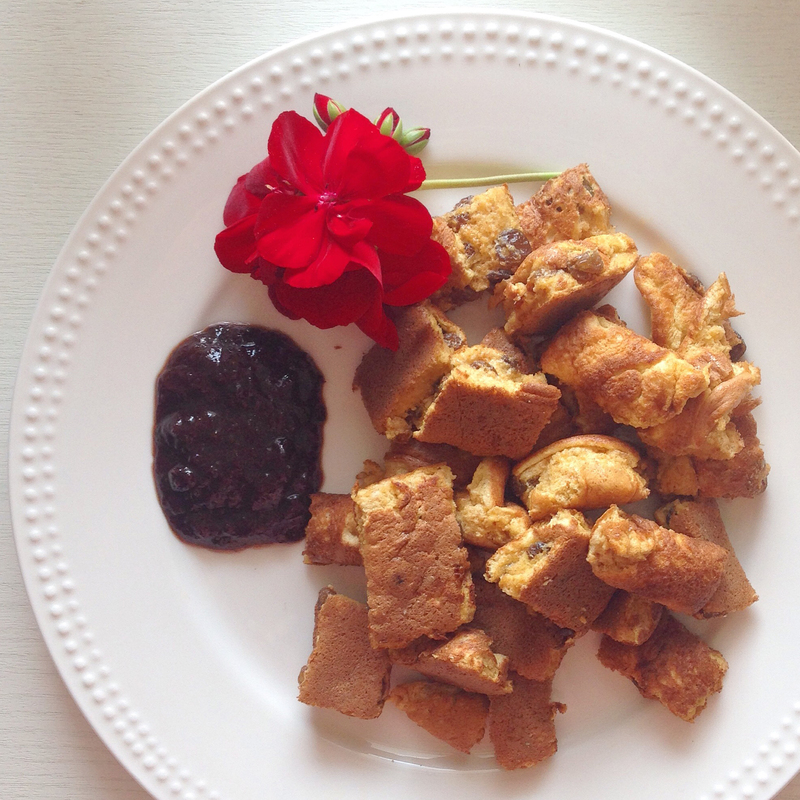 Using a spatula or a plastic knife, cut the Kaiserschmarrn into small rectangles (while still in the pan), toss and cook for additional minute or 2 and serve warm with jam or apple sauce.